Shaving concrete on an industrial floor is a precise preparation method for removing an existing floor coating, or simply to remove a thin layer of concrete. Shaving the concrete floor is a process to remove material at a uniform depth from 1/32 inch to 1/4 inch in one pass...consistently. Contact Concare to determine the right preparation method for your industrial concrete floor. 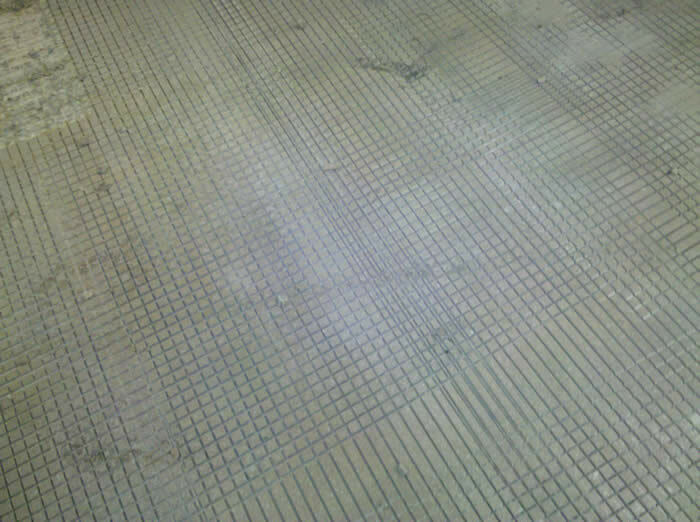 Grooving concrete on the industrial floor is another preparation method used to create a pattern on the concrete floor. It can help remove multiple layers of existing floor toppings by cutting into the concrete floor surface, and creating a checkerboard like pattern. Most concrete grooves are cut approximately 1 inch to 2 inch apart and can cut through the industrial concrete floor as shallow or deep as necessary. Then, a scarifier or milling machine can remove that topping much more efficiently. When industrial concrete floor safety striping is in a critical, never going to change location, Concare utilizes the concrete preparation method, grooving to create a 4 inch to 6 inch wide depression directly into the concrete floor without affecting the rest of the concrete floor. The striping material is poured into the depression reducing wear caused by forklifts and other traffic.